Fluorotelomers Market size is calculated to grow from over 26 kilo tons in 2015, with growth estimates of over 12.5% CAGR up to 2023. Environmental risks pertaining to perfluorooctyl sulfonate (PFOS) usage have resulted in the implementation and introduction of stringent regulations. Rise in fire safety consciousness accompanied by regulatory compliance by EPA and EU to discourage PFOS derived products were among the key trends to drive global fluorotelomers market size. Europe fluorotelomers market share for fire-fighting foam application was worth over USD 15 million in 2015. Minimizing fire spread, re-ignition resistance, smoke pollution reduction accompanied by chemical and thermal stability are some of the key features to enhance demand in firefighting foams application. Global textile production was estimated at over 90 million tons in 2014. Textile industry expansion in China, India, Bangladesh and Pakistan accompanied by regulatory inclination to improve manufacturing output at domestic level were among the stimulating factors to drive fluorotelomers industry growth. High demand from domestic segment for different textiles type owing to the increase in disposable income and rise in living standard are expected driving factors to witness high demand over the forecast period. This industry is essentially a close sub-set of the global fluorochemicals market. Growing demand from niche applications including magazine paper, metal plating, photography, and semiconductor due to its effective results and eco friendly nature may drive demand in this segment. Global paper production was estimated at over 400 million tons is 2013, with Asia Pacific accounting for 45% of the total volume. Glossy paper magazine demand growth in order to give aesthetic look accompanied by its features to absorb extra oil in food & beverages packaging should instigate fluorotelomers market growth in this segment. Food & beverages packaging spending in order to improve quality and attract consumers by providing premium product appearance should instigate demand in this segment. Key raw materials, vinylidene fluoride, chlorotrifluoroethylene, tetrafluoroethylene, and hexafluoropropene, may face restriction in production and usage due to hazardous nature. This may result in tight supply situation and can affect fluorotelomers market price trend. For instance, the U.S. and EPA have phased out the refrigerant blends containing hexafluoropropene usage under 64 FR 3865. Technology innovation and development in niche applications such as surfactants & repellants, liquid crystal additives, electronics, optics, pharmacological and biological may create opportunity for fluorotelomers market growth. Fluorotelomer alcohols market size was valued at over USD 111 million in 2015. FTOH is a chemical intermediate to manufacture fluoro-organic compounds, which are used in paper coatings, fabric stain repellants and surfactants. Growing household sector spending in India, China, Kuwait, and Qatar owing to rapid urbanization and change in lifestyle may drive regional demand over the forecast period. South Africa and Nigeria are promising countries to observe FTOH consumption due to increasing surfactants importance to enhance production output. Fluorotelomer iodide (FI) market is considered to witness highest growth rate with estimated gains of over 13% up to 2023. Low surface energy, improved chemical stability, enhanced surface lubricity were the key properties to boost demand in this segment. Growing construction and electronics industry is predicted to create new opportunities for FI demand. Textile application industry was worth over USD 125 million in 2015. These products are used in textiles treatment and medical textiles in order to improve stain resistance cause by solvents, chemicals, and dust. 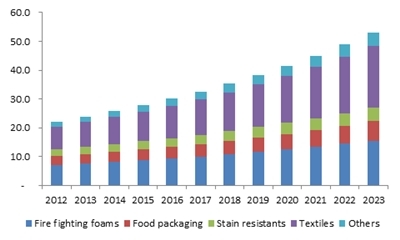 Increasing chemical agents’ popularity in textile industry to impart impregnate and wetting properties were few influencing factors to drive demand in this segment. Food packaging application is set to attain growth rates at over 11% CAGR from 2016 to 2023. These products consists grease resistance property, which is making it preferable to use in packaging of fast food wrappers, microwave popcorn bags, pizza box liners, and candy wrappers. Food retail expansion accompanied by change in eating habits may trigger fluorotelomers market growth in this segment. APAC, led by China and India fluorotelomers market size, dominated the regional demand and generated revenues worth over USD 157 million in 2015. Government subsidies and FDI in textile industry was the key factor to drive regional demand. Europe, influenced by Germany, Italy, and France textile industry growth is predicted to attain growth rates at over 12% CAGR by 2023. MEA is set grow at a significant rate mainly led by increase in cloth spending in Turkey, Egypt, & Saudi Arabia. Growing construction expenditure in Brazil is expected to be a promising factor to drive demand in Latin America. Telomer manufacturing companies are often integrated from raw material supply to manufacturing stage. Vendors, wholesalers and traders enter into a contract with manufacturing companies and buyers. Third party agreements results may add value to the final product, but they also ensure continuous material supply to the buyer.